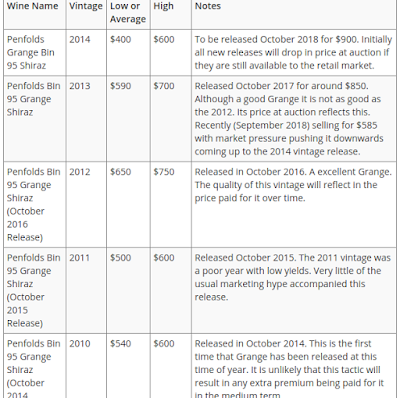 The 2014 Grange is about to hit the market with the first reviews out this morning. Tony Love in The Advertiser gives it 98 points out of 100 as a "solid gold Grange in body as well as soul, yet chamfered and measured, even subtly minerally but with no hard edges." For Frank Wilden at Business Insider it's a "great Grange" with the palate "ridiculously seductive and easy to enjoy with such generosity of character and balance." And all that for the recommended retail price set by Penfolds at $900 a bottle - up $50 from last year's suggestion. 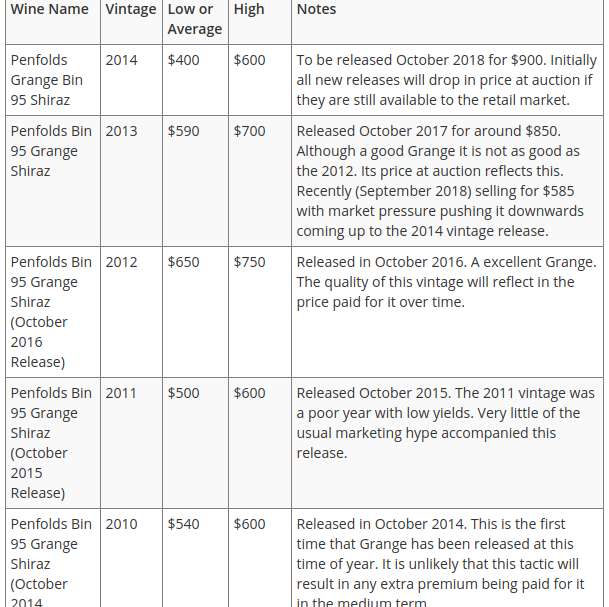 Before rushing out with your plastic have a think about this interesting summary of the prices collected and averaged from the four leading wine auction houses in Australia on a monthly basis by the wine auctioneers Wickmans.